I’m not going to call this the ‘Summer Solstice’ because we now know that below the equator they are celebrating their beginning of winter. We are increasingly conscious that we are One World. We are part of one small ball in space experiencing the solar rays as waxing and waning depending on our own cycle around this star, either tilting towards it or away from it, also depending on whether we are above the equator or below. 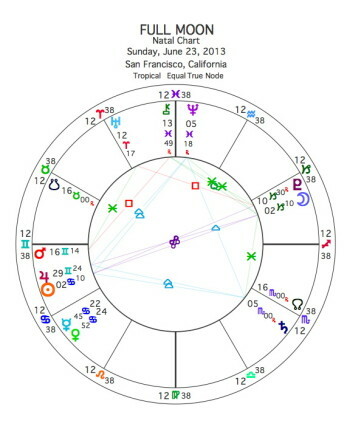 Let’s look at the chart for this Solstice: We see the Sun entering Cancer just barely ahead of Jupiter, still in Gemini. 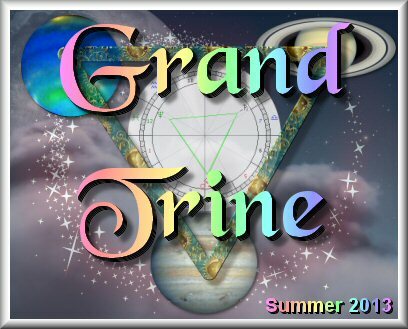 We see a fairly tight Grand Trine in Water with Sun trine Saturn, Saturn trine Neptune, and Neptune trine the Sun. Jupiter is also part of this Grand Trine, but out of sign right now. We also note that the Moon is in Scorpio (another water sign) but waxing inconjunct (147-149 degrees) from Jupiter/Sun. What can this mean, and how can you apply it to your own life in the next three months and beyond? First, you’ll need to go to your own Natal Chart and see just where 0 degrees of Cancer falls. This is where the Sun is meant to illuminate your life for the next three months, as it always does every single year at this time. Next you’ll want to see where all the Water signs fall in your chart. With a classic Aries Rising chart, the Water signs will fall in the 4th, 8th, and 12th houses rather naturally. These are the Water houses. However, if you have an Aquarian rising chart, the Water signs would tend to fall in your 2nd, 6th, and 10th houses. Keep these in mind as I enumerate the various configurations bearing in mind that the degrees of each planet are also important in knowing where they fall in your own personal natal map. SUN JOINING JUPITER: This is going to be big stuff! Jupiter always expands and exaggerates whatever it touches, so expect Cancer themes to get this enlargement. Issues like family, home, home ownership, security, early childhood development, and all of the many enterprises and businesses relating to home and family will be emphasized. Also, Cancer has much to do with nourishment and food, so expect these themes to also be enormous. Cancer also has much to do with consumerism period! Who will have this enormous ‘appetite’ next on the global scene? Watch for where this plays out, especially in countries with large-scale populations, or countries gaining economic prosperity. Because Jupiter always makes things ‘bigger than life’ expect the polarities of feast and famine to be enlarged upon as well. Some will win big time, while others will lose big time. The point here is that these themes are going to be in high profile. Wherever this Sun/Jupiter falls in your own chart will be emphasized in a big way for these next three months. JUPTER ENTERS CANCER. By June 25th we will find Jupiter in the sign of its ‘Exaltation’ for approximately one year. The higher qualities of Jupiter here are added protectiveness, nourishment, and preservation. I will be devoting an entire article to Jupiter in Cancer, so suffice it to say for now that we will all need to become more proactive in applying the higher principles of those qualities in our own lives. Certainly all you Cancer sun signs will get an enormous boost this coming year. Please take advantage of this! You are being given much grace to accomplish your goals. Personally and collectively this Jupiter/Sun configuration will emphasize all our environmental concerns or lack of concern. Remember that Jupiter/Sun is also the signature of self-aggrandizement, reckless exploitation, and prideful identification with a god-like megalomania. We need to be fully aware of the shadow of this aspect as we strive towards what constitutes true nourishment, protection of life, and on-going preservation of the resources we have stewardship with. SUN/JUPITER TRINE SATURN: Thank goodness this aspect is part of the whole! Saturn in Scorpio lends some brevity and realism to the Sun’s exuberance. With Jupiter and Saturn now beginning to form a long-standing trine, this also indicates greater discipline, responsibility, and control where desires for expansion and opportunism are concerned. In your own chart Saturn in Scorpio is where you need to limit, structure, and face greater discipline in all your endeavors, but for quite awhile you will have a greater sense of balance between the two great principles of expansion and contraction operating in your personal life. SUN/JUPITER TRINE NEPTUNE: This can either be a visionary aspect of great spiritual propensity or a further illusionary escape from facing reality. It can be an energy wave of increased compassion and empathy for all, with special emphasis on children and animals, or an easy pathway towards greater manipulation and control via media propaganda, consumer addictions on a mass scale, and religious dogmas which hold people in old patterns of guilt and shame still in need of ‘saviors’. In your own chart Neptune (with Chiron) in Pisces heralds a long journey of inner spiritual work as certain forms dissolve away. Neptune is not of this world and often disappoints when misused to gain what is only an illusion. 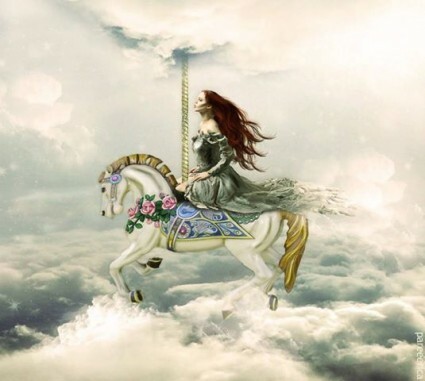 NEPTUNE TRINE SATURN: This aspect connects the dots of this very large Grand Trine in Water by enabling all of us to transcend boundaries as we become increasingly aware of ecological issues ever at the foreground now. We are ever gaining a new awareness of the loss of species and habitat, as well as the wholesale undermining of our very planet due to a lack of consciousness as ignorance and greed continue to devour resources that will never be regained. It’s interesting that the mid-point between Neptune and Saturn is symbolic of sickness and poisoning. This is literally what we are all facing now, whether collectively or personally. How many people do you know who are fighting cancer? It is the disease of our time. We are all vulnerable due to the poisoning of every aspect of life here on earth at this time. The higher aspect of Neptune combined with Saturn is compassionate wisdom, or wisdom with compassion. Where does this need to be applied in your own life? We need both. This is also a good aspect with which to make our visions a reality. JUPITER/SUN INCONJUNCT THE MOON: The Moon is waxing away from the Sun indicating that this is a time of persevering through the various fluctuations of circumstance and continuing to adjust, yet staying centered within oneself and committed to ones goals. The Moon is also in square to Neptune, and semi-square to Pluto indicating that purification is called for as well as a sensitive attunement to one’s inner guidance rather than outer manipulations. In other words, this is a clear call to listening to and exercising your own conscience! THE WATERY REALM: Yes, we are entering a time of many planets in Water which will all support the work of Pluto in Capricorn towards greater transformation of all seemingly solid and invincible structures and institutions. The opposite may also manifest with the Plutocracy gaining greater control through emotional manipulation and subterfuge, or simply blatant power grabs. The realm of water in astrology is the symbol for Soul, the emotional realm, and the astral realm. 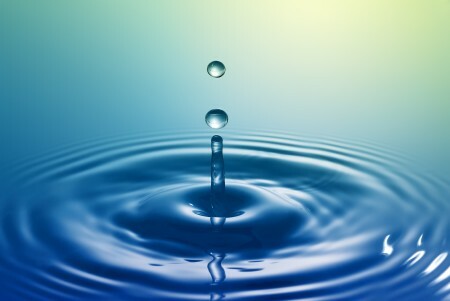 Water symbolizes feelings. This realm is often manipulated now by mass media. For example, look at all the movies coming out for this summer. How many of them deal with horror, terror, violence, hate, and mayhem? Just count them. What do these mass media profiteers want the collective to feed on? Can they truly say this is what the public wants? I say that is a cop out. Who is willing to take any responsibility for what children are fed? When a small child enters a theater with an enormous screen and is blasted with powerful images that sear into their unconscious something takes place. What takes place? There are many enormous questions right now regarding what Bruce Lipton terms the ‘hypnogogic downloading’ of data into a child’s brain and consciousness. They are especially going to be in our faces with Jupiter in Cancer. Again, I will address this in my Jupiter in Cancer article more fully. Think carefully now about what you are feeding yourself when it comes to your emotional life. Are you feeding the part of you that wants more joy, love, and peace? Emotional honesty is now called for. This takes us on a dive into the unconscious realm as well. All the unseen realms are going to be emphasized this coming year in a very strong way. Water symbolizes secrets and all the hidden subterranean depths of the human psyche. It also symbolizes the subtle dimensions where other entities often hide and with stealth feed on those unawares. Oh yes, how many of us are aware that the unseen dimensions are inhabited by not just viruses, bacteria, and mutant cells, but also actual entities? Think about that one for awhile! Perhaps we will learn more about the astral realm in the months ahead. So this Grand Trine makes is EASY one way or another. It can easily support higher consciousness and compassionate feelings as much as those of the lower realms. These geometric patterns have nothing to do with consciousness remember. WE DO. That is why we have choice on this planet. It is our level of consciousness that makes the choices, NOT the patterns in the sky. These patterns simply mirror the archetypal energies that we work with at any given moment through life. What then do we have the opportunity to cultivate with this vast watery realm? We can penetrate with power and force the depths of our emotional commitments and remember just how powerful water really is. Water can erode stone. Water can go over, under, and through anything eventually. We can strengthen our intuitive and psychic energies which are able to penetrate deeply into the mysteries of what is not visible on the surface and MOVE energies. Yes, psychic powers are very real. We can develop greater empathy for all of life. We can link with animals through inter-species communication. We can link with the devic kingdom. We can link with the very stones. Linking telepathically is part of the watery realm. We can all become Spiritual healers by moving beyond the old paradigm of victim/savior, for we all now have access to higher consciousness if we are willing to learn. We can all find a solid and direct channel for our emotional fluidity that equates with STRENGTH. Emotional strength is what gives heroes their edge. They do not waver or buckle under duress. We all need that now and this configuration, this Grand Trine of Jupiter-Saturn-Neptune reinforced momentarily by the Sun in Cancer gives us the solid boost we need. Finally, there will be a Full Moon quickly following this Solstice on June 23rd showing the Moon in Capricorn joining Pluto in a strong ‘Kite Configuration’ with this Grand Trine in Water. This Moon/Pluto triggers the explosive Uranus/Pluto square. It will be important to stay conscious and aware of all of your relationships during this time period. Invoking higher wisdom and consciousness in all our transactions and dealings with others will protect us from being duped or manipulated. Staying connected with our higher Self will also keep us clear and well grounded in the full potential of applying the principles of wisdom and compassion in all that we do. Great article. Love the part about the unseen realm not being just for viruses and bacterial. Very goo point you make there. As for the movies, I truly believe we should work with movies as if they are our collective dreams. If our society were my client, I’d explore these movie-dreams. Notwithstanding the violence, there’s so much about men vs. machine vs. nature. “Pacific Rim” is one that comes to mind, where a gigantic monster comes from the deep oceans, and the heroes wear this robotic contraption to fight it. Then there are all the superheroes. “Man of Steel” seems to be poised as the big blockbuster, and to me, he seems like a marriage between Saturn, Uranus and Neptune. The theme of these hero movies is that our shining heroes are all facing their shadows: internally and externally. It seems that they are being invited to their own underworld, just as us, our collective is too. One way to look at why these violent movies keep on being made, is that the are the collective dreams of a society that is traumatized. Just like a client might have recurring dreams until they deal with the underlying issue, so will we. Some theme is definitely being worked out, especially when we see that our superheroes trajectories follow a resurrection and messianic theme. Thanks, as always, for your great contributions Vanessa! You have a skill in interpreting movies from a symbolic perspective. And astrology lends itself so well to that sphere. I agree that movies mirror the collective, though I also feel that they are forms of manipulation considering who has the money to produce them. In that vein I encourage everyone to view the independent movies that are coming out, many of which are excellent. We truly need more variety here as well. The mono-culture world is not a place that encourages diversity! But you have a special gift, Vanessa, for exploring this realm for the rest of us. Your blog is wonderful! Thanks for the enlightening info! You are welcome Anje’, and your name fits right in here so appropriately! Oh yes, I agree too that there’s much manipulation going on and that we need to find movies (tv shows, books, etc) that resonate with us and that also offer a different view. A media fasting every so often is good too. It does upset me for example all these movies about world destruction and zombies. This is quite a fascinating chart if you look at it from a mundane perspective. It looks like the focus of the country is going to be on domestic issues (Sun in 4th House), with a whole lot of financial focus — Saturn is in the 8th house of Other People’s Money, trine the Sun. Interestingly, Saturn rules the 11th house (in mundane houses, Government funding — 2nd from the 10th), which would seem to be a good sign for the economy … but the trine from Neptune in the 12th house of hidden enemies is a real concern, compounded by the fact that Saturn also rules the 12th house in this chart. I’m not trilled with the chain of events here … the Sun starts out with that Grand Trine to Saturn and Neptune, then heads straight into an opposition with Pluto, followed by a square to Uranus and trine to Chiron. This may be a rough summer for the United States. And in this chart, the Sun rules the 6th house of jobs … I wonder if that’s the main arena where this dance will play out. 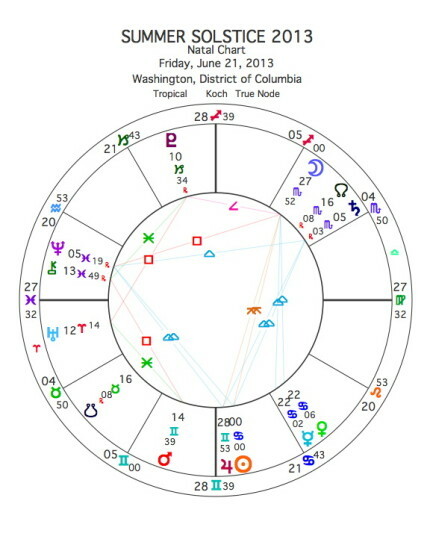 I’m also not thrilled about how effective Obama will be as a leader in this chart — he’s represented by Jupiter in Gemini — in detriment and combust (within 8 degrees of the Sun). Combust planets are hidden from view, and planets in Detriment are very strong, but use their strength to get themselves into trouble. I’d say we’re in for a period of time in the United States where there’s a lot of deception and misdirection around finances, including deals with people whom we don’t realize are our enemies, and all of this distracts from what may really be going on in our own back yard. But that’s really not much of a prediction … sadly, it’s more of an observation. Mundane astrology is not my bag by any stretch, but the chart caught my eye. Thank you for your very astute ‘observations’ Kevin. They give us much to ponder. I almost put the chart of the United States up with the solstice as the outer wheel, but didn’t want to make my article too long. Now I think I’ll add it so people can see the connections. Obama, of course, has that ‘Janus’ moon in Gemini, and the Jupiter effect has certainly exaggerated his tendencies to say one thing and do just the opposite. Also troubling from my viewpoint is the Cardinal Uranus square with Pluto edging ever closer to the challenge aspects with the US Sun square Saturn. One wonders how much will be left of the Constitution when that dynamic is over in 2015. I certainly don’t profess to be any expert in Mundane interpretation myself but I, too, see much that is disturbing ahead for any remnants of a true Democracy to survive.